We shall be weekly in the West End! Following a season of smash-hit performances during 2018, we are delighted to mark the 243rd anniversary of Austen’s birth (on 16 December 1775) by announcing that we will begin a Monday night residency at the Fortune Theatre, London from 18 February 2019. Tickets are ON SALE NOW, giving you enough time to secure a last-minute Christmas present for the Austen/comedy/getting-out-of-the-house lover in your life. What’s more, a new loyalty card is also being introduced offering you a fifth performance for free once you’ve attended four performances at the Fortune Theatre. It is entirely different every time after all, so why not start every week with a dose of the best medicine! Press your breeches, bow your bonnets and head for London, as we are delighted to announce that we are extending our time in the West End. After a wonderful jaunt this winter and two sell-out shows, we are transferring to The Savoy Theatre, for there is nowhere quite like London in the spring! 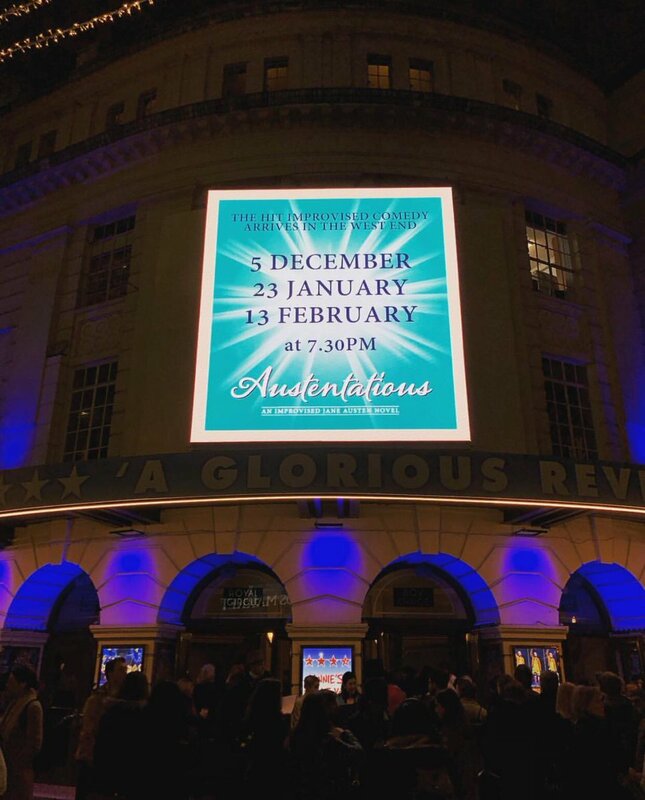 Our first jaunt in the West End’s capacious Piccadilly Theatre took place before Christmas, and now we are set to tread the hallowed boards for a second time, on Tuesday 23rd January. We can scarcely wait! Last month’s show saw wassailing regency carol singers hailing the crowds as they streamed in from Piccadilly Circus, passing under our name in lights on the building exterior, before our brand new secret set was unveiled from within its mysterious packing crate. The show itself was a romping tale of marital estrangement, and youthful yearning, taking in locations as varied as a beachside pier, a twilit graveyard, a coastal B&B and Ibiza. Exactly as Jane herself would have written it. All in all it was an utter delight to transfigure our fanciful show into a West End spectacular, replete with some brand new Georgian costumes that would make even Darcy preen with pride, a pair of transcendent musicians in accompaniment, two halves of intrigue and romance, and our very own delightful drawing room. Not to mention a quite enchanting audience packing out the three sweeping tiers of the playhouse. It wasn’t just fun and exhilarating, but emotional too. So, overwhelmed and elated, we naturally want nothing more than to do it all again. If you hurry there are a handful of tickets available for January’s show, and a handful more for February, and we are pleased to say that if you keep your eyes peeled we will shortly be able to announce the next three months after that. You didn’t think we’d have quite this much fun and not come back, did you? 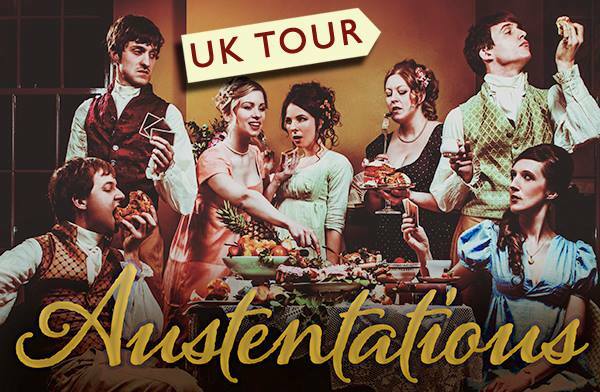 Saddle the horses & prepare the carriage, dear friends, for Austentatious are on tour again! Details of our theatrical peregrinations across these fair Isles can be found here or, should you find yourself in London, pray do favour us with your company in one of the city’s fine playhouses!